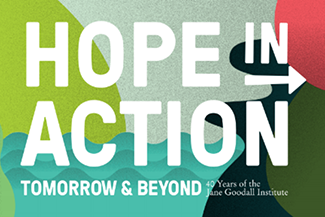 Dr. Jane Goodall had a single dream: to study wildlife in Africa. When she was 26 years old, she was given an opportunity, by a innovative scientist named Louis Leakey, to achieve this dream in a place called Gombe. Gombe, Tanzania, has since Dr. Goodall’s studies been the home of ongoing behavioral, biological, and other research on wild chimpanzees (Learn more about Gombe here). Many exceptional minds have passed through Gombe, providing their own imprint on this significant location, leaving with a reshaped imagination. Bill Wallauer, a man with his eyes on the pulse of the world as a wildlife filmmaker and photographer, lived for 15 years among the wild chimpanzees of Gombe National Park. Every year, he returns to the unparalleled magnificence and ever changing riddle that is Gombe to capture more of its singular light, sounds and wild residents. 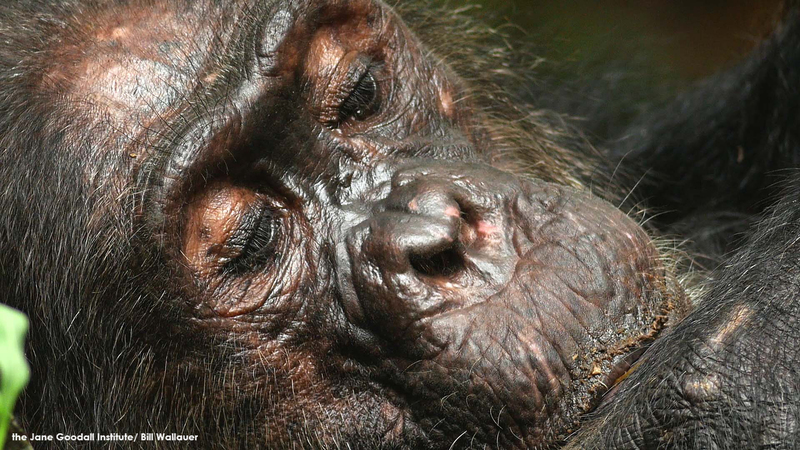 Here we share his latest trek’s writings; a window into the Congo Basin through the lens of an adoring and ever inquisitive old friend to Gombe’s wild chimpanzees. Today was another great day with a large group of chimps. Again, they were spread out in thickets and were very difficult to see. As is often the case, the rainy season provided a thick cloud cover, which made shooting and identifying chimps very difficult. After shooting a fun nest play session in the treetops from the peak, I moved into Kakombe Valley to start my search. I checked each small gathering of chimps I could find. Their loud pant hoots and food grunts (their way of saying ‘Yum’!) showed me the way. After getting some close shots of the nest play, I descended further into south and found nothing but shaking bushes and dark thickets. I dropped a bit further down the valley and found a large fresh chimp track in the trail; I realized it must be an adult male. Within a minute, I came upon Faustino resting in an opening in beautiful light. What a reward it is just to have a clear view. The bright overcast gave his face a deep shine. I quickly threw on my longest lens (which is equivalent to ~2500mm) and shot some of my best face detail close-ups ever. As I was shooting, two other chimps passed on my right and I managed to get a few shots of a very small baby riding on mother’s belly. 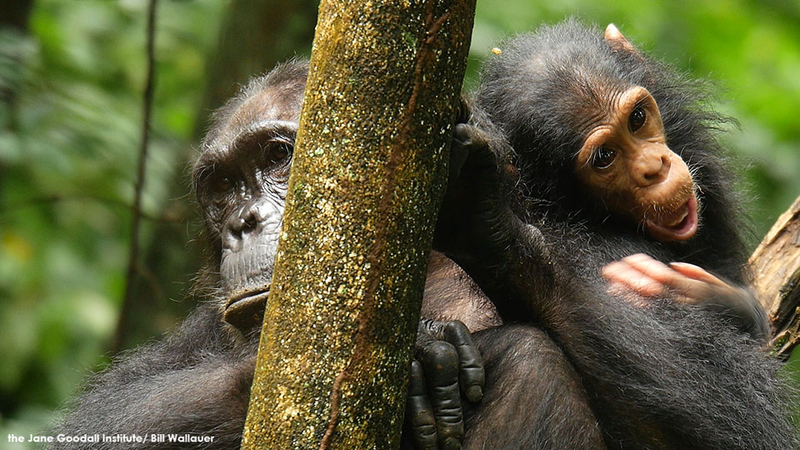 How cool it is to see the strong hands of a baby chimp clutching mom’s long hair. As they moved out of my frame, I wondered who the mother was; possibly Gaia? While I was looking around as other chimps came and went, Gaia indeed had joined the group. She was greeted by Faustino, and climbed up a small tree. Woohoo! I finally had a clear view of Gaia and Gabo. Gabo, is named after the head of the field research staff here at Gombe, who also happens to be the first person I followed chimps with in 1992. Gabo (the baby chimp, not the man) played quietly in Gaia’s lap. He is still at that unsteady stage of life. Even reaching out to grab a blade of grass can be a challenge. Everything he touched went right in his mouth; sound familiar? As they sat together, Gaia gently cuddled her active son. As I watched, Gabo climbed up Gaia’s side and onto her left shoulder. The tree they were in split my frame as I shot some nice portraits of the two. Gabo did well to entertain himself, and often had a smile or play face as he reached for objects around him, or nuzzled into mom’s hair. I am still not sure if the first infant I shot was Gabo. They are at an age which causes them all to look very similar, and I hesitate to say anything definitive unless I am 100% sure. In any case, I will try to get some nice portraits of all of the new infants here (I think there are at least five). I didn’t see Golden at all, but I did manage to get a few nice shots of some of the juveniles and adolescents, as well as a shot or two of the new Alpha male Fudge (yes, Jane named a chimp after chocolate: a favorite treat with whiskey at the end of every day here). Gaia climbed down and moved away, but then stopped to wait for her mother, Gremlin. Gabo again wobbled toward any object he could get his hands on, and I captured one last image before they disappeared into the vegetation. It was a great day and a sheer joy to hang out with the chimps. Maybe Golden will be less in the thick of things tomorrow! 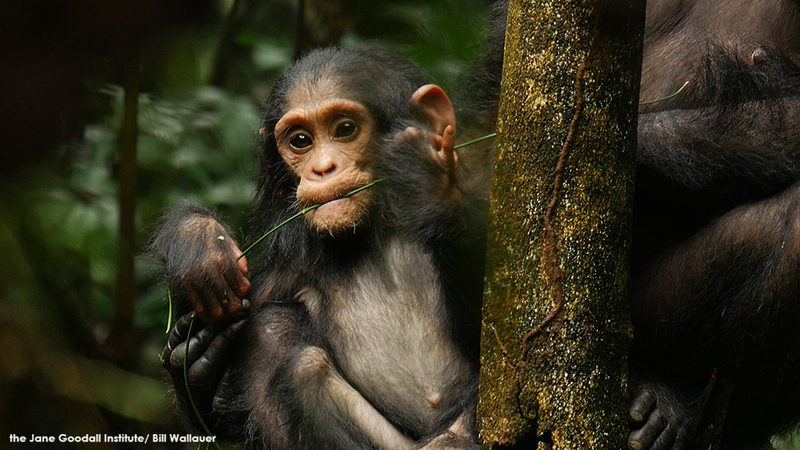 Keep up with all the tail-less tales of Gombe’s chimpanzees right here on GFAN. You can also explore Gombe through Google Street View and get a little closer to Dr. Goodall’s favorite place on earth here. 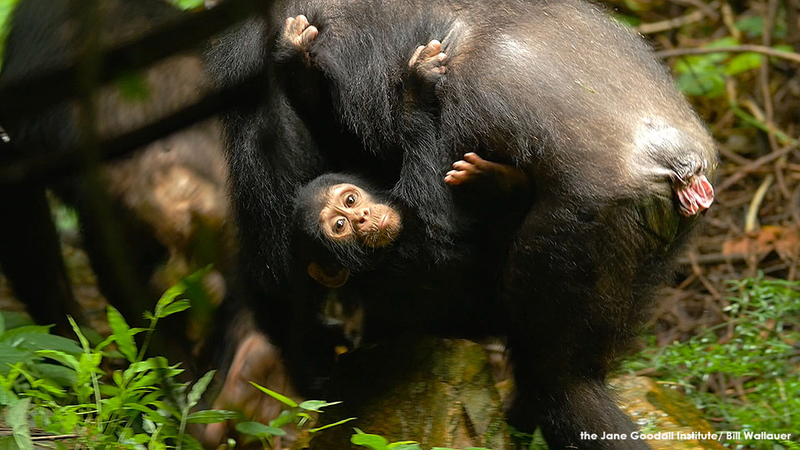 Stay tuned for more from Bill’s journey to Gombe, and support our primate research at JGI here. Bill Wallauer became part of the life at the Jane Goodall Institute's Gombe Stream Research Center in 1989 while on assignment for the U.S. Peace Corps in southern Tanzania. After he captured a wild chimpanzee birth on videotape, Dr. Goodall asked Bill to follow chimps and record their daily activities and behaviors, which he did for the next 15 years. Bill has served as camera operator and scientific adviser for more than 30 productions, including BBC/Animal Planet’s “Chimp Week,” BBC/Discovery’s 10-part series, “Planet Earth," and Disney Nature’s “Chimpanzee.” He also worked on three National Geographic films in 2014 and 15. He shot the closing sequence for the BBC/Discovery's 10-part series, "Planet Earth," and appeared in the Animal Planet special, "Almost Human," with Jane Goodall. Today, Bill is a sought-after speaker for adults and youth and a JGI filmmaker.